Why Do We Still 'Give Away' A Bride During Her Wedding?Why Do We Still 'Give Away' A Bride During Her Wedding? Why Do We Still 'Give Away' A Bride During Her Wedding? Home > Blog > WEDDING > Tips & Advice > Why Do We Still ‘Give Away’ Brides As A Ritual At Weddings? Why Do We Still ‘Give Away’ Brides As A Ritual At Weddings? Wedding customs, across the world, are vastly different. But if there’s one that is common among a lot of cultures, it’s the ceremony where brides are “given away”. In India, we know it commonly as ‘kanyadaan‘. During a wedding, the bride’s parents hand her over to her husband, her new caretaker, so to speak. In popular culture, including Hollywood and Bollywood, this custom is often romanticized. It’s supposed to be a deeply emotional moment when parents “let go” of their little girl. But, far from being sweet and emotional, this custom is rooted deep in patriarchal, misogynist practices. In the 18th, 19th, and even early 20th century, women were commonly thought of as lesser beings who didn’t deserve the same rights as men. Women couldn’t vote, couldn’t own property, couldn’t take decisions independently about their own bodies, and didn’t have much of an individual identity. So, when they were married, they were passed from one man (her father) to another (her husband). WHAT’S THE POINT OF GIVING A BRIDE AWAY? 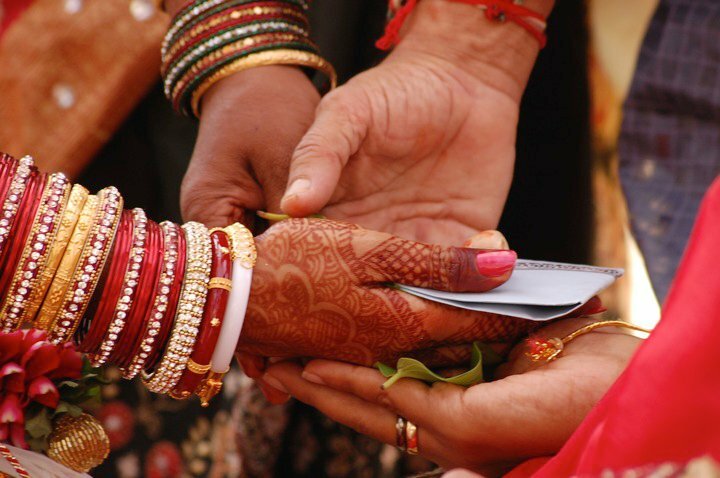 In Hindu weddings, this tradition is known as ‘kanyadaan’. ‘Kanya’ translates to ‘girl’ and ‘daan’ means ‘donation’. In Sikh weddings, only the father is supposed to give away the bride, making the tradition even more sexist than it already is. Sometimes, both parents step in for the palla ceremony. But, in most cases, it’s the bride’s father’s job. In most Christian weddings too, it is the father who gives the bride away. This isn’t a commentary on the flaws of each religion. It’s a statement on how we tend to accept these practices blindly in the name of tradition. In 2016, a Sikh woman became a viral sensation when pictures emerged of her giving away her daughter. The bride’s father had left them years ago and, instead of asking another male relative to step in, the mother decided to do this ceremony herself. This was seen as a statement on giving equal importance to the bride’s mother during a wedding. However, while the world celebrated the change in gender roles there, we didn’t stop to question the fundamental flaw in the ceremony itself. TIME TO MAKE OUR WEDDINGS MORE EQUAL? Now, a lot of brides don’t want to think about this tradition and its problematic roots. They’ll go along with it as one more ritual in the sea of wedding customs. But maybe we need to give this ritual more thought. Maybe we need to replace it with something more pleasant. Instead of giving a bride away, why not welcome the groom into the family? It would be far more realistic and progressive to welcome a son and not give away a daughter. Imagine how nice this custom would be, and how much warmth it would generate between both families from the beginning! Instead of sticking to convention, Stallings chose a rather unique way to honour her father at her wedding. “He’s a poet, and so we asked him to read one of his poems. It was beautiful, and infinitely more meaningful to me than being ceremonially given away,” Stallings says. In fact, why should anyone have to give their child away during a wedding? Why should a woman agree to be palmed off in this manner? Time to change our wedding customs, perhaps?